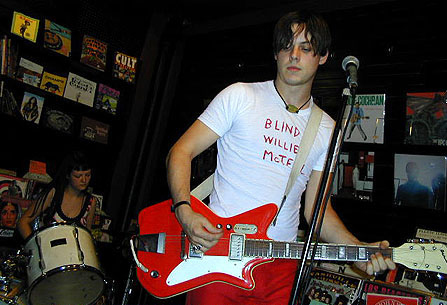 Just posted a picture of Dave Grohl wearing a sharpied Van Halen shirt and I remembered this photo of Jack White wearing a low budget sharpied Blind Willie McTell shirt. Jack White considers McTell an influence, as The White Stripes 2000 album “De Stijl” was dedicated to him and featured a cover of his song “Southern Can Mama“. The White Stripes also covered McTell’s “Lord, Send Me an Angel“, releasing it as a single in 2000.